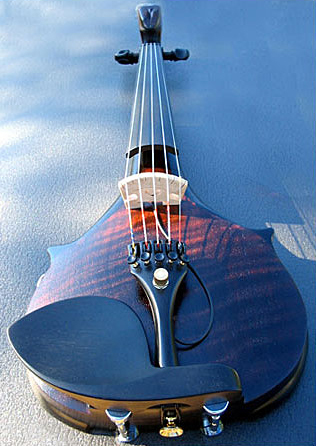 This instrument was commissioned by a former student of mine. The designing was done by the two of us, beginning with looking at and altering various pencil drawings. The player wanted a half-body instrument made from Black Walnut, which I acquired a stunning piece of from one of my wood suppliers in Oregon. At the outset, I told the player that the instrument would be heavy, owing to the amount and type of wood used. I routed out a lot of wood from the back of the instrument to lighten the weight, and then made a rounded triangular Ebony lid to cover the space. The output jack and electronics were then placed in this routed-out space. 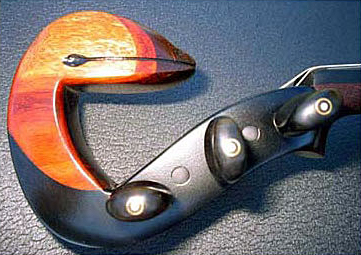 There were three finishes used on this instrument: a red-tinted analine dye as a base, a Danish oil overcoat, and a finish coat of clear lacquer. The pegs are standard wood pegs, and the bridge is a Barbera 5-string Twin-Hybrid, employing 10 piezo pickups – 2 for each string. This is the brand of bridge I recommend to anyone commissioning an instrument from me, as the sound is consistently excellent. 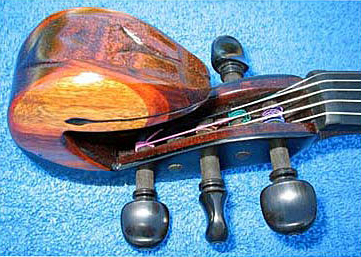 The most unique feature of this instrument is the “head” extension of the peg box. The player asked the head be a replication of the “flower” in a Pink Floyd video. It was constructed using four different species and colors of wood which were glued together using progressively smaller pieces so that when the “flower” was sanded and carved, all four woods would be seen as appearing in a layered form. For ease of putting new strings on the D and A pegs, the “flower” needed to be high enough above the peg box to allow the hand to insert the new string into the peg hole. 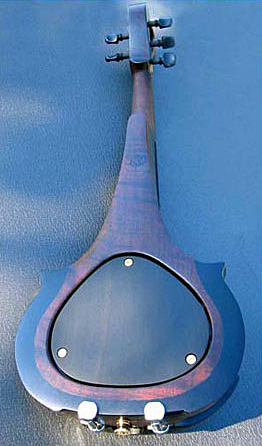 On a personal note, this is the last instrument I made before my father died. 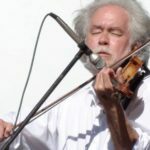 Dad was always encouraging, and said a number of times, regarding the instrument: “Make it a good one.”, which helped me through the the construction, and also during the process of his passing from this world to the next. The player was quite happy with the result. I believe that my dad is, too.